One of the marketing world’s greatest frustrations has long been the lack of data from Google and other search engines about the behavior of users on their platforms. Occasionally, Google will divulge a nugget of bland, hard-to-interpret information about how they process more than X billion queries, or how many videos were uploaded to YouTube, or how many people have found travel information on Google in the last year. But these numbers aren’t specific enough, well-sourced enough, nor do they provide enough detail to be truly useful for all the applications we have. Marketers need to know things like: How many searches happen each month across various platforms? Is Google losing market share to Amazon? Are people really starting more searches on YouTube than Bing? Is Google Images more or less popular than Google News? 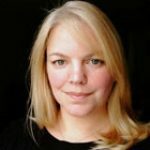 What percent of queries are phrased as questions? 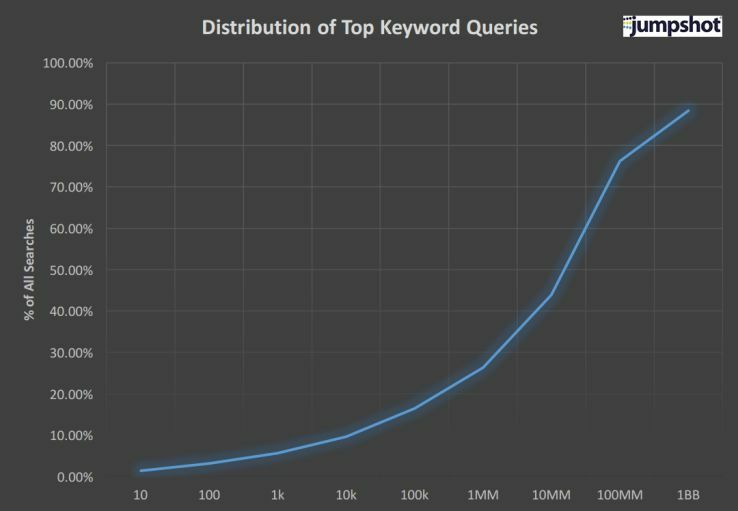 How many words are in the average query? Is it more or less on mobile? These kinds of specifics help us know where to put our efforts, how to sell our managers, teams, and clients on SEO investments, and, when we have this data over time, we can truly understand how this industry that shapes our livelihoods is changing. Until now, this data has been somewhere between hard and impossible to estimate. But, thanks to clickstream data providers like Jumpshot (which helps power Moz’s Keyword Explorer and many of our keyword-based metrics in Pro), we can get around Google’s secrecy and see the data for ourselves! Over the last 6 months, Russ Jones and I have been working with Jumpshot’s Randy Antin, who’s been absolutely amazing — answering our questions late at night, digging in with his team to get the numbers, and patiently waiting while Russ runs fancy T-Distributions on large datasets to make sure our estimates are as accurate as possible. If you need clickstream data of any kind, I can’t recommend them enough. If you’re wondering, “Wait… I think I know what clickstream data is, but you should probably tell me, Rand, just so I know that you know,” OK. 🙂 Clickstream monitoring means Jumpshot (and other companies like them — SimilarWeb, Clickstre.am, etc.) have software on the device that records all the pages visited in a browser session. They anonymize and aggregate this data (don’t worry, your searches and visits are not tied to you or to your device), then make parts of it available for research or use in products or through APIs. They’re not crawling Google or any other sites, but rather seeing the precise behavior of devices as people use them to surf or search the Internet. Clickstream data is awesomely powerful, but when it comes to estimating searcher behavior, we need scale. Thankfully, Jumpshot can deliver here, too. Their US panel of Internet users is in the millions (they don’t disclose exact size, but it’s between 2–10) so we can trust these numbers to reliably paint a representative picture. That said, there may still be biases in the data — it could be that certain demographics of Internet users are more or less likely to be in Jumpshot’s panel, their mobile data is limited to Android (no iOS), and we know that some alternative kinds of searches aren’t captured by their methodology**. Still, there’s amazing stuff here, and it’s vastly more than we’ve been able to get any other way, so let’s dive in. Methodology: All of the data was collected from Jumpshot’s multi-million user panel in October 2016. T-distribution scaling was applied to validate the estimates of overall searches across platforms. All other data is expressed as percentages. Jumpshot’s panel includes mobile and desktop devices in similar proportions, though no devices are iOS, so users on Macs, iPhones, and iPads are not included. #1: How many searches are *really* performed on Google.com each month? On the devices and types of queries Jumpshot can analyze, there were an average of 3.4 searches/day/searcher. Using the T-Distribution scaling analysis on various sample set sizes of Jumpshot’s data, Russ estimated that the most likely reality is that between 40–60 billion searches happen on Google.com in the US each month. How does that compare to numbers Google’s given? Well, in May of 2016, Google told Search Engine Land they “processed at least 2 trillion searches per year.” Using our Jumpshot-based estimates, and assuming October of 2016 was a reasonably average month for search demand, we’d get to 480–720 billion annual searches. That’s less than half of what Google claims, but Google’s number is WORLDWIDE! Jumpshot’s data here is only for the US. This suggests that, as Danny Sullivan pointed out in the SELand article, Google could well be handling much, much more than 2 trillion annual searches. Note that we believe our 40–60 billion/month number is actually too low. Why? Voice searches, searches in the Google app and Google Home, higher search use on iOS (all four of which Jumpshot can’t measure), October could be a lower-than-average month, some kinds of search partnerships, and automated searches that aren’t coming from human beings on their devices could all mean our numbers are undercounting Google’s actual US search traffic. In the future, we’ll be able to measure interesting things like growth or shrinkage of search demand as we compare October 2016 vs other months. #2: How long is the average Google search session? From the time of the initial query to the loading of the search results page and the selection of any results, plus any back button clicks to those SERPs and selection of new results, the all-in average was just under 1 minute. If that seems long, remember that some search sessions may be upwards of an hour (like when I research all the best ryokans in Japan before planning a trip — I probably clicked 7 pages deep into the SERPs and opened 30 or more individual pages). Those long sessions are dragging up that average. #3: What percent of users perform one or more searches on a given day? This one blew my mind! Of the millions of active, US web users Jumpshot monitored in October 2016, only 15% performed at least one or more searches in a day. 45% performed at least one query in a week, and 68% performed one or more queries that month. To me, that says there’s still a massive amount of search growth opportunity for Google. If they can make people more addicted to and more reliant on search, as well as shape the flow of information and the needs of people toward search engines, they are likely to have a lot more room to expand searches/searcher. #4: What percent of Google searches result in a click? Google is answering a lot of queries themselves. From searches like “Seattle Weather,” to more complicated ones like “books by Kurt Vonnegut” or “how to remove raspberry stains?“, Google is trying to save you that click — and it looks like they’re succeeding. 66% of distinct search queries resulted in one or more clicks on Google’s results. That means 34% of searches get no clicks at all. If we look at all search queries (not just distinct ones), those numbers shift to a straight 60%/40% split. I wouldn’t be surprised to find that over time, we get closer and closer to Google solving half of search queries without a click. BTW — this is the all-in average, but I’ve broken down clicks vs. no-clicks on mobile vs. desktop in #19 below. #5: What percent of clicks on Google search results go to AdWords/paid listings? It’s less than I thought, but perhaps not surprising given how aggressive Google’s had to be with ad subtlety over the last few years. Of distinct search queries in Google, only 3.4% resulted in a click on an AdWords (paid) ad. If we expand that to all search queries, the number drops to 2.6%. Google’s making a massive amount of money on a small fraction of the searches that come into their engine. No wonder they need to get creative (or, perhaps more accurately, sneaky) with hiding the ad indicator in the SERPs. #7: What percent of clicks on Google search results go to links in the Knowledge Graph? Knowledge panels are hugely popular in Google’s results — they show up in ~38% of MozCast‘s dataset. But they’re not nearly as popular for search click activity, earning only ~0.5% of clicks. I’m not totally surprised by that. Knowledge panels are, IMO, more about providing quick answers and details to searchers than they are about drawing the click themselves. If you see Knowledge Panels in your SERPs, don’t panic too much that they’re taking away your CTR opportunity. This made me realize that Keyword Explorer is probably overestimating the degree to which Knowledge Panels remove organic CTR (e.g. Alice Springs, which has only a Knowledge Panel next to 10 blue links, has a CTR opportunity of 64). I think this happens because people are naturally drawn to images and because Google uses click data to specifically show images that earn the most engagement. If you’re wondering why your perfectly optimized image isn’t ranking as well in Google Images as you hoped, we’ve got strong suspicions and some case studies suggesting it might be because your visual doesn’t draw the eye and the click the way others do. If Google only shows compelling images and only shows the image block in search results when they know there’s high demand for images (i.e. people search the web, then click the “image” tab at the top), then little wonder images earn strong clicks in Google’s results. #9: What percent of clicks on Google search results go to News/Top Stories results? Gah! We don’t know for now. This one was frustrating and couldn’t be gathered due to Google’s untimely switch from “News Results” to “Top Stories,” some of which happened during the data collection period. We hope to have this in the summer, when we’ll be collecting and comparing results again. #10: What percent of clicks on Google search results go to Twitter block results? I was expecting this one to be relatively small, and it is, though it slightly exceeded my expectations. MozCast has tweet blocks showing in ~7% of SERPs, and Jumpshot shows those tweets earning ~0.23% of all clicks. My guess is that the tweets do very well for a small set of search queries, and tend to be shown less (or shown lower in the results) over time if they don’t draw the click. As an example, search results for my name show the tweet block between organic position #1 and #2 (either my tweets are exciting or the rest of my results aren’t). Compare that to David Mihm, who tweeted very seldomly for a long while and has only recently been more active — his tweets sit between positions #4 and #5. Or contrast with Dr. Pete, whose tweets are above the #1 spot! #11: What percent of clicks on Google search results go to YouTube? Technically, there are rare occasions when a video from another provider (usually Vimeo) can appear in Google’s SERPs directly. But more than 99% of videos in Google come from YouTube (which violates anti-competitive laws IMO, but since Google pays off so many elected representatives, it’s likely not an issue for them). Thus, we chose to study only YouTube rather than all video results. MozCast shows videos in 6.3% of results, just below tweets. In Jumpshot’s data, YouTube’s engagement massively over-performed its raw visibility, drawing 1.8% of all search clicks. Clearly, for those searches with video intent behind them, YouTube is delivering well. #12: What percent of clicks on Google search results go to personalized Gmail/Google Mail results? I had no guess at all on this one, and it’s rarely discussed in the SEO world because it’s so relatively difficult to influence and obscure. We don’t have tracking data via MozCast because these only show in personalized results for folks logged in to their Gmail accounts when searching, and Google chooses to only show them for certain kinds of queries. Jumpshot, however, thanks to clickstream tracking, can see that 0.16% of search clicks go to Gmail or Google Mail following a query, only a little under the number of clicks to tweets. #13: What percent of clicks on Google search results go to Google Shopping results? The Google Shopping ads have become pretty compelling — the visuals are solid, the advertisers are clearly spending lots of effort on CTR optimization, and the results, not surprisingly, reflect this. MozCast has Shopping results in 9% of queries, while clickstream data shows those results earning 0.55% of all search clicks. #14: What percent of Google searches result in a click on a Google property? Google has earned a reputation over the last few years of taking an immense amount of search traffic for themselves — from YouTube to Google Maps to Gmail to Google Books and the Google App Store on mobile, and even Google+, there’s a strong case to be made that Google’s eating into opportunity for 3rd parties with bets of their own that don’t have to play by the rules. Honestly, I’d have estimated this in the 20–30 percent range, so it surprised me to see that, from Jumpshot’s data, all Google properties earned only 11.8% of clicks from distinct searches (only 8.4% across all searches). That’s still significant, of course, and certainly bigger than it was 5 years ago, but given that we know Google’s search volume has more than doubled in the last 5 years, we have to be intellectually honest and say that there’s vastly more opportunity in the crowded-with-Google’s-own-properties results today than there was in the cleaner-but-lower-demand SERPs of 5 years ago. #15: What percent of all searches happen on any major search property in the US? I asked Jumpshot to compare 10 distinct web properties, add together all the searches they receive combined, and share the percent distribution. The results are FASCINATING! If the Google Images data shocks you, you’re not alone. I was blown away by the popularity of image search. Part of me wonders if Halloween could be responsible. We should know more when we re-collect and re-analyze this data for the summer. Images wasn’t the only surprise, though. Bing and Yahoo! combine for not even 1/10th of Google.com’s search volume. DuckDuckGo, despite their tiny footprint compared to Facebook, have almost as many searches as the social media giant. Amazon has almost as many searches as Bing. And YouTube.com’s searches are nearly twice the size of Bing’s (on web browsers only — remember that Jumpshot won’t capture searches in the YouTube app on mobile, tablet, or TV devices). For the future, I also want to look at data for Google Shopping, MSN, Pinterest, Twitter, LinkedIn, Gmail, Yandex, Baidu, and Reddit. My suspicion is that none of those have as many searches as those above, but I’d love to be surprised. BTW — if you’re questioning this data compared to Comscore or Nielsen, I’d just point out that Jumpshot’s panel is vastly larger, and their methodology is much cleaner and more accurate, too (at least, IMO). They don’t do things like group site searches on Microsoft-owned properties into Bing’s search share or try to statistically sample and merge methodologies, and whereas Comscore has a *global* panel of 2 million, Jumpshot’s *US-only* panel of devices is considerably larger. 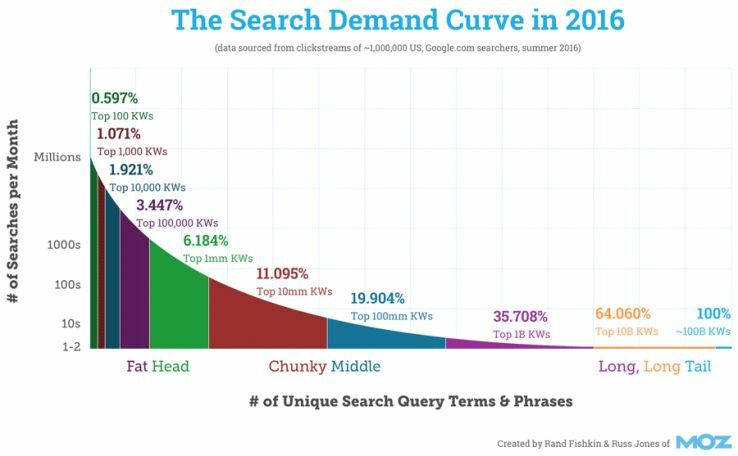 #16: What’s the distribution of search demand across keywords? The long tail is still very long indeed, with a huge amount of search volume taking place in keywords outside the top 10 million most-searched-for queries. In fact, almost 25% of all search volume happens outside the top 100 million keywords! I illustrated this last summer with data from Russ’ analysis based on Clickstre.am data, and it matches up fairly well (though not exactly; Jumpshot’s panel is far larger). 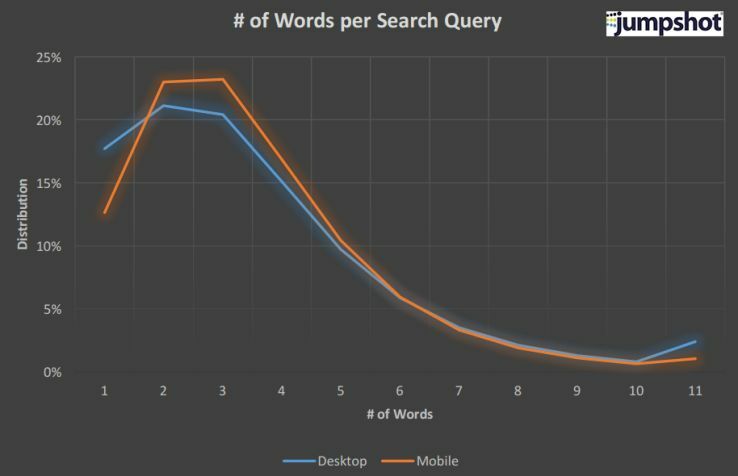 #17: How many words does the average desktop vs. mobile searcher use in their queries? share of queries of 6 words or more than mobile (16% for desktop vs. 14% for mobile). I was actually surprised to see how close desktop and mobile are. Clearly, there’s not as much separation in query formation as some folks in our space have estimated (myself included). #18: What percent of queries are phrased as questions? #19: What is the difference in paid vs. organic CTR on mobile compared to desktop? This is one of those data points I’ve been longing for over many years. We’ve always suspected CTR on mobile is lower than on desktop, and now it’s confirmed. For mobile devices, 40.9% of Google searches result in an organic click, 2% in a paid click, and 57.1% in no click at all. For desktop devices, 62.2% of Google searches result in an organic click, 2.8% in a paid click, and 35% in no click. That’s a pretty big delta, and one that illustrates how much more opportunity there still is in SEO vs. PPC. SEO has ~20X more traffic opportunity than PPC on both mobile and desktop. If you’ve been arguing that mobile has killed SEO or that SERP features have killed SEO or, really, that anything at all has killed SEO, you should probably change that tune. #20: What percent of queries on Google result in the searcher changing their search terms without clicking any results? You search. You don’t find what you’re seeking. So, you change your search terms, or maybe you click on one of Google’s “Searches related to…” at the bottom of the page. I’ve long wondered how often this pattern occurs, and what percent of search queries lead not to an answer, but to another search altogether. The answer is shockingly big: a full 18% of searches lead to a change in the search query! No wonder Google has made related searches and “people also ask” such a big part of the search results in recent years. #22: What percent of Google queries result in pogo-sticking (i.e. the searcher clicks a result, then bounces back to the search results page and chooses a different result)? As SEOs, we know pogo-sticking is a bad thing for our sites, and that Google is likely using this data to reward pages that don’t get many pogo-stickers and nudge down those who do. Altogether, Jumpshot’s October data saw 8% of searches that followed this pattern of search > click > back to search > click a different result. Over time, if Google’s successful at their mission of successfully satisfying more searchers, we’d expect this to go down. We’ll watch that the next time we collect results and see what happens. #23: What percent of clicks on non-Google properties in the search results go to a domain in the top 100? Many of us in the search and web marketing world have been worried about whether search and SEO are becoming “winner-take-all” markets. Thus, we asked Jumpshot to look at the distribution of clicks to the 100 domains that received the most Google search traffic (excluding Google itself) vs. those outside the top 100. The results are somewhat relieving: 12.6% of all Google clicks go to the top 100 search-traffic-receiving domains. The other 87.4% are to sites in the chunky middle and long tail of the search-traffic curve. Phew! That’s an immense load of powerful data, and over time, as we measure and report on this with our Jumpshot partners, we’re looking forward to sharing trends and additional numbers, too. If you’ve got a question about searcher behavior or search/click patterns, please feel free to leave it in the comments. I’ll work with Russ and Randy to prioritize those requests and make the data available. It’s my goal to have updated numbers to share at this year’s MozCon in July. Rand: What search sources, if any, might be missed by Jumpshot’s methodology? 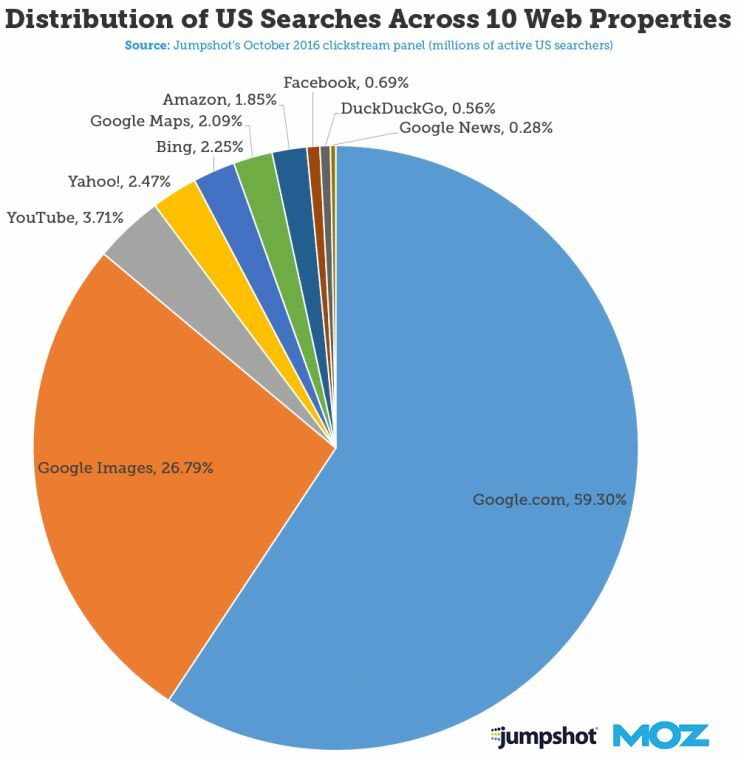 Jumpshot: We only looked at Google.com, except for the one question that asked specifically about Amazon, YouTube, DuckDuckGo, etc. Rand: Do you, for example, capture searches performed in all Google apps (maps, search app, Google phone native queries that go to the web, etc)? Jumpshot: Nothing in-app, but anything that opens a mobile browser — yes. Rand: Do you capture all voice searches? Jumpshot: If it triggers a web browser either on desktop or on mobile, then yes. Rand: Is Google Home included? Rand: Are searches on incognito windows included? Jumpshot: Yes, should be since the plug-in is at the device level, we track any URL regardless. Rand: Would searches in certain types of browsers (desktop or mobile) not get counted? Jumpshot: From a browser perspective, no. But remember we have no iOS data so any browser being used on that platform will not be recorded.